YOU MAY ALSO ADVERTISE YOUR BUSINESS (HARDWARE STORES, CONSTRUCTION SUPPLIES, ETC.) OR YOUR PROFESSION (ARCHITECT, HOME-BUILDER, ETC.). "Hi, we have sold our property (RH-716) in Lower Camanjac, Dumaguete City. The buyer found it on your great website. Please put the SOLD sign on the listing. Thank you." Are you selling/renting properties - lots, houses, farms, condo units, or beachfront properties, etc.? Try the Internet, try us! We'll include your properties for salerent in our website - complete with information and plenty of pictures of the properties. Once your properties are included in our website, they will be seen by many people around the world who are searching for properties to buy/rent. They will be seen by anyone 24 hours a day, 7 days a week! And communication is lightning-fast, too! Thanks to the power of the Internet. Let your properties be seen by those who can really afford them! Our target market includes: Filipinos here and abroad, Foreigners, OFW's, and Businessmen from all places. 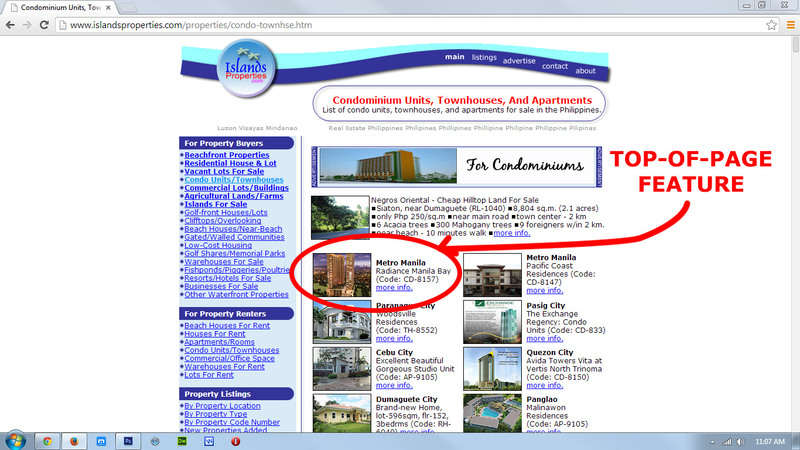 Our website, IslandsProperties.com, is one of the most visited real estate websites in the Philippines. It is well-advertised and promoted in major Internet Search Engines and Directories - consistently ranked among TOP 10 & TOP 20 SEARCH RESULTS - so that people searching the Internet for properties to buy can easily see our website. Furthermore, properties included in our website are well-presented with pictures and information. The website currently receives around 5,360 UNIQUE VISITORS daily (based on April 2010 stats). properties in the philippines, beachfront properties in the philippines, house and lot in the philippines, lands for sale in the philippines. house for sale in Bohol, properties in Cebu, Metro Manila houses for sale, Makati condos for rent, Cebu houses for rent, etc. We create the webpages, host them in our website, include in our listing, and promote in Internet Search Engines and Directories. Buyers/Renters will contact you directly by phone or email, no broker/agent to give commission to. e-mail account (if person has no email acct.). Let buyers around the world see your property ad really fast! 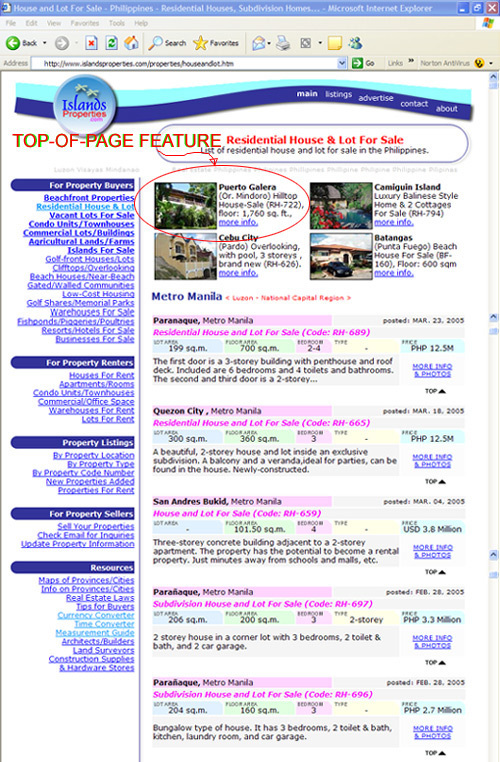 Advertise the property on the FRONT/MAIN PAGE of our website under FEATURED PROPERTIES. Note: This is just an option. 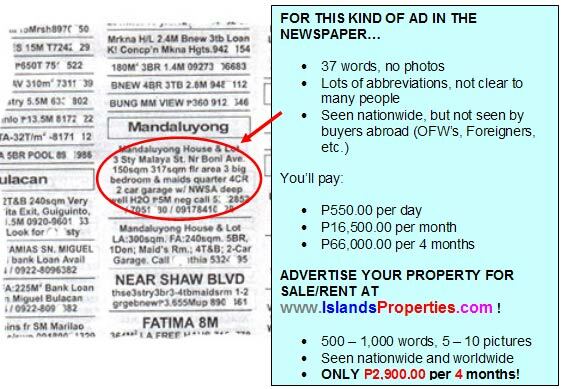 PHP 2,000.00 is only for Front Page Feature for 1 month. You will pay for the chosen plan separately. 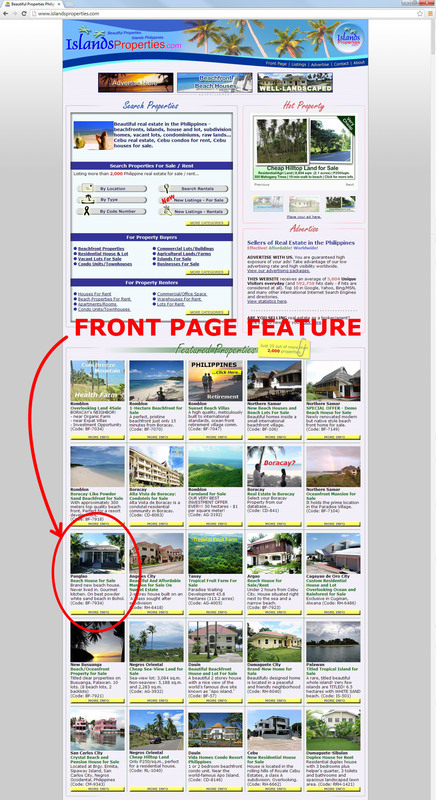 Example, if you have chosen BRONZE PLAN, then you will pay PHP 2,900.00 PLUS PHP 2,000.00 for Front Page Feature. Total = PHP 4,900.00. In this example, your property will be advertised in our website for 4 months, PLUS it will be featured in our FRONT PAGE for 1 month (within the 4-month period, we usually feature the property during the first month).